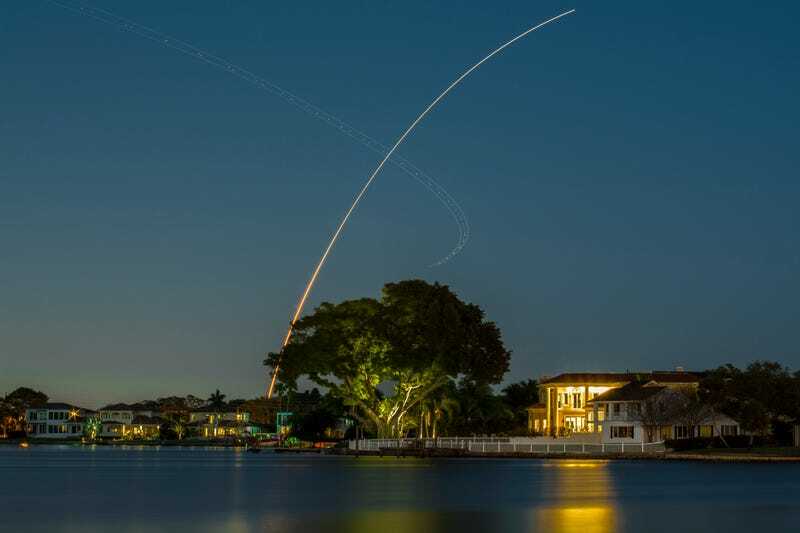 Tonight there was yet another rocket launch, but this one has a fun story. And I take full credit for getting it on broadcast on television. Or at least that’s what I’ll tell myself. Today was not SpaceX, but ULA sending up a Delta IV to put the WGS-9 satellite in orbit for the Air Force. The launch was supposed to happen at 7:44pm, just minutes after sundown. This presents issues in doing a long exposure shot. I threw three different ND filters on my Nikkor 50mm and dialed the lens to f/16. The plan was to do two minutes worth of of 5 to 10 second exposures and to stack them. Thankfully, there was a technical delay of about 40 minutes, so I could take off the filters and do it one shot. There was still too much ambient light to really let the star trails look strong, but I got something cooler. A plane approaching for landing at the St. Petersburg/Clearwater airport swooped through the shot. This coupled with perfect visibility made this one come out really great. I am, and will remain, 100% convinced that I and I alone was responsible for the launch getting on international television. And there is nothing you can do or say to make me think otherwise. Just let me have this one, ok? If anyone cares, my picture was a 126 second exposure at f/11 and ISO 100. And there is yet another night launch scheduled for late next week. I’m highly considering driving over for it. Oh, one more thing about shooting tonight’s launch. A slightly older couple had taken their teenage grandson down to the bayou to fish for a bit. They came over and asked what I was taking a picture of. I told them and they were quite excited and decided to wait around for the launch. The grandson had some learning disability, but he was a bright little dude. We all chatted as we waited for the rocket. As soon as he asked, his grandparents said “Well, we should probably be going.” They hustled their grandson in the car and were gone in seconds. The moaning went on for another 5 minutes. I guess there were two blast offs tonight.